Candace Chen, a millennial drone self-sequestered in a Manhattan office tower, is devoted to routine: her work, watching movies with her boyfriend, avoiding thoughts of her recently deceased Chinese immigrant parents. So she barely notices when a plague of biblical proportions sweeps the world. Candace joins a small group of survivors, led by the power-hungry Bob, on their way to the Facility, where, Bob promises, they will have everything they need to start society anew. But Candace is carrying a secret she knows Bob will exploit. Should she escape from her rescuers? 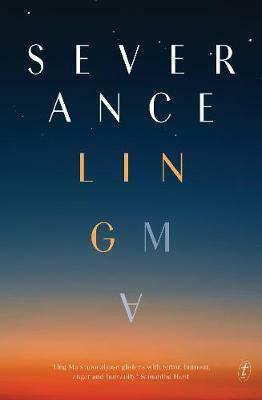 A send-up and takedown of the rituals, routines and missed opportunities of contemporary life, Severance is a moving family story, a deadpan satire and a heartfelt tribute to the connections that drive us to do more than survive.